If she were not playing, she had to sew or study or dust, or read a stent in a story-book. Letitia had very nice story-books, but she was not particularly fond of reading. She liked best of anything to sit quite idle, and plan what she would like to do if she could have her wish — and that her Aunt Peggy would not allow. Letitia studied the little green door more than she studied her lesson-books, but she never got any nearer the solution of the mystery, until one Sunday morning in January. It was a very cold day, and she had begged hard to stay home from church. Her Aunt Peggy and the maid-servant, old as they were, were going, but Letitia shivered and coughed a little and pleaded, and finally had her own way. After Aunt Peggy and the old servant, in their great cloaks and bonnets and fur tippets, had gone out of the yard and down the road, Letitia sat quiet for fifteen minutes or so, hunting in the Bible for easy texts; then suddenly she thought of the little green door, and wondered, as she had done so many times before, if it could possibly be opened. She laid down her Bible and stole out through the kitchen to the cheese-room and tried the door. It was locked just as usual. “Oh, dear!” sighed Letitia, and was ready to cry. It seemed to her that this little green door was the very worst of all her trials; that she would rather open that and see what was beyond than have all the nice things she wanted and had to do without. Suddenly she thought of a little satin-wood box with a picture on the lid which Aunt Peggy kept in her top bureau-drawer. Letitia had often seen this box, but had never been allowed to open it. “I wonder if the key can be in that box,” said she. She did not wait a minute. She was so naughty that she dared not wait for fear she should remember that she ought to be good. She ran out of the cheese-room, through the kitchen and sitting-room, to her aunt's bedroom, and opened the bureau drawer, and then the satin-wood box. It contained some bits of old lace, an old brooch, a yellow letter, some other things which she did not examine, and, sure enough, a little black key on a green ribbon. 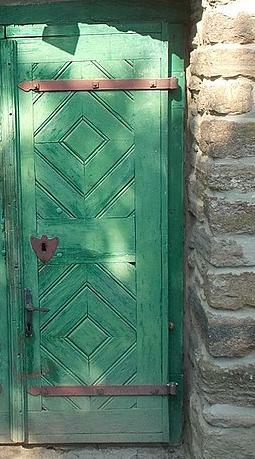 Letitia had not a doubt that it was the key of the little green door. She trembled all over, she panted for breath, she was so frightened, but she did not hesitate. She took the key and ran back to the cheese-room. She did not stop to shut the satin-wood box or the bureau drawer. She was so cold and her hands shook so that she had some difficulty in fitting the key into the lock of the little green door; but at last she succeeded, and turned it quite easily. Then, for a second, she hesitated; she was almost afraid to open the door; she put her hand on the latch and drew it back. It seemed to her, too, that she heard strange, alarming sounds on the other side. Finally, with a great effort of her will, she unlatched the little green door, and flung it open and ran out. Then she gave a scream of surprise and terror, and stood still staring. She did not dare stir nor breathe. She was not in the open fields which she had always seen behind the house. She was in the midst of a gloomy forest of trees so tall that she could just see the wintry sky through their tops. She was hemmed in, too, by a wide, hooping undergrowth of bushes and brambles, all stiff with snow. There was something dreadful and ghastly about this forest, which had the breathless odor of a cellar. And suddenly Letitia heard again those strange sounds she had heard before coming out, and she knew that they were savage whoops of Indians, just as she had read about them in her history-book, and she saw also dark forms skulking about behind the trees, as she had read. Then Letitia, wild with fright, turned to run back into the house through the little green door, but there was no little green door, and, more than that, there was no house. Nothing was to be seen but the forest and a bridle-path leading through it. Letitia gasped. She could not believe her eyes. She ran out into the path and down it a little way, but there was no house. The dreadful yells sounded nearer. She looked wildly at the undergrowth beside the path, wondering if she could hide under that, when suddenly she heard a gun-shot and the tramp of a horse's feet. She sprang aside just as a great horse, with a woman and two little girls on his back, came plunging down the bridle-path and passed her. Then there was another gun-shot, and a man, with a wide cape flying back like black wings, came rushing down the path. Letitia gave a little cry, and he heard her. Then all at once a log-house appeared beside the path, and someone was holding the door ajar, and a white face was peering out. The door was flung open wide as they came up, the man rushed in, set Letitia down, shut the door with a crash, and shot some heavy bolts at top and bottom. Letitia was so dazed that she scarcely knew what happened for the next few minutes. She saw there a pale-faced woman and three girls, one about her own age, two a little younger. She saw, to her great amazement, the horse tied in the corner. She saw that the door was of mighty thickness, and, moreover, hasped with iron and studded with great iron nails, so that some rattling blows that were rained upon it presently had no effect. She saw three guns set in loopholes in the walls, and the man, the woman, and the girl of her own age firing them, with great reports which made the house quake, while the younger girls raced from one to the other with powder and bullets. Still, she was not sure she saw right, it was all so strange. She stood back in a corner, out of the way, and waited, trembling, and at last the fierce yells outside died away, and the firing stopped. “They have fled,” said the woman with a thankful sigh. Then Letitia realized what she had not done before, that all the daylight was shut out of the house; that they had for light only one tallow candle and a low hearth fire. It was very cold. Letitia began to shiver with cold as well as fear. Suddenly the woman turned to her with motherly kindness and curiosity. “Who is this little damsel whom you rescued, husband?” said she. “What is your name, little girl?” asked the woman, while the three little girls looked wonderingly at the new-comer. “Letitia Hopkins,” replied Letitia in a small, scared voice. “Letitia Hopkins, did you say?” asked the woman doubtfully. They all stared at her, then at one another. “And it is mine, too,” said the eldest girl. Letitia gave a great jump. There was something very strange about this. Letitia Hopkins was a family name. Her grandmother, her father's mother, had been Letitia Hopkins, and she had always heard that the name could be traced back in the same order for generations, as the Hopkinses had intermarried. She looked up, trembling, at the man who had saved her from the Indians. “Will you please tell me your name, sir?” she said. “John Hopkins,” replied the man, smiling kindly at her. “Captain John Hopkins,” corrected his wife. Letitia gasped. That settled it. Captain John Hopkins was her great-great-great-grandfather. Great-aunt Peggy had often told her about him. He had been a notable man in his day, among the first settlers, and many a story concerning him had come down to his descendants. A queer miniature of him, in a little gilt frame, hung in the best parlor, and Letitia had often looked at it. She had thought from the first that there was something familiar about the man's face, and now she recognized the likeness to the miniature. It seemed awful, and impossible, but the little green door led into the past, and Letitia Hopkins was visiting her great-great-great-grandfather and grandmother, great-great-grandmother, and her great-great-aunts. Letitia looked up in the faces, all staring wonderingly at her, and all of them had that familiar look, though she had no miniature of the others. Suddenly she knew that it was a likeness to her own face which she recognized, and it was as if she saw herself in a looking-glass. She felt as if her head was turning round and round, and presently her feet began to follow the motion of her head, then strong arms caught her, or she would have fallen. When Letitia came to herself again, she was in a great feather bed, in the unfinished loft of the log-house. The wind blew in her face, a great star shone in her eyes. She thought at first she was out of doors. Then she heard a kind but commanding voice repeating: “Open your mouth,” and stared up wildly into her great-great-great-grandmother's face, then around the strange little garret, lighted with a wisp of rag in a pewter dish of tallow, and the stars shining through the crack in the logs. Not a bit of furniture was there in the room, besides the bed and an oak chest. Some queer-looking garments hung about on pegs and swung in the draughts of the wind. It must have been snowing outside, for little piles of snow were scattered here and there about the room. “Where — am — I?” Letitia asked feebly, but no sooner had she opened her mouth than her great-great-great-grandmother, Goodwife Hopkins, who had been watching her chance, popped in the pewter spoon full of some horribly black and bitter medicine. Goodwife Hopkins had a kind and motherly way, but a way from which there was no appeal. Letitia swallowed the bitter dose. “Now go to sleep,” ordered Goodwife Hopkins. Letitia went to sleep. There might have been something quieting to the nerves in the good physic. She was awakened a little later by her great-great-grandmother and her two great-great-aunts coming to bed. They were to sleep with her. There were only two beds in Captain John Hopkins's house. Letitia had never slept four in a bed before. There was not much room. She had to turn herself about crosswise, and then her toes stuck into the icy air, unless she kept them well pulled up. But soon she fell asleep again. About midnight she was awakened by wild cries in the woods outside, and lay a minute, numb with fright, before she remembered where she was. Then she nudged her great-great-grandmother, Letitia, who lay next her. “What's that?” she whispered fearfully. “Oh, it's nothing but a catamount. Go to sleep again,” said her great-great-grandmother sleepily. Her great-great-aunt, Phyllis, the youngest of them all, laughed on the other side. “She's afraid of a catamount,” said she. Letitia could not go to sleep for a long while, for the wild cries continued, and she thought several times that the catamount was scratching up the walls of the house. When she did fall asleep it was not for long, for the fierce yells she had heard when she had first opened her little green door sounded again in her ears. This time she did not need to wake her great-great-grandmother, who sat straight up in bed at the first sound. Both the great-great-aunts were awake; they all listened, scarcely breathing. The yells came again, but fainter; then again, and fainter still. Letitia's great-great-grandmother settled back in bed again. The little great-great-aunt Phyllis laughed again. “She can't go to sleep because she heard Injuns,” she tittered. But poor Letitia slept no more till four o'clock. Then she had just fallen into a sweet doze when she was pulled out of bed. Letitia found that her bedfellows were up and dressed and downstairs. She heard a queer buzzing sound from below, as she stood in her bare feet on the icy floor and gazed about her, dizzy with sleep. With that, Goodwife Hopkins descended to the room below, and Letitia dressed herself. It did not take her long. There was not much to put on beside a coarse wool petticoat and a straight little wool gown, rough yarn stockings, and such shoes as she had never seen. “I couldn't run from Injuns in these,” thought Letitia miserably. When she got downstairs she discovered what the buzzing noise was. Her great-great-grandmother was spinning. Her great-great-aunt Candace was knitting, and little Phyllis was scouring the hearth. Goodwife Hopkins was preparing breakfast. Letitia looked helplessly at a great spinning-wheel in the corner, then at her great-great-great-grandmother. “I don't know how,” she faltered. Then all the great-grandmothers and the aunts cried out with astonishment. “She doesn't know how to spin!” they said to one another. “I don't know how to knit,” stammered Letitia. Then there was another cry of astonishment. Goodwife Hopkins cast about her for another task for this ignorant guest. “Explain the doctrine of predestination,” said she suddenly. Letitia jumped up and stared at her with scared eyes. “Don't you know what predestination is?” demanded Goodwife Hopkins. “No, ma'am,” half sobbed Letitia. Her great-great-grandmother and her great-great-aunts made shocked exclamations, and her great-great-great-grandmother looked at her with horror. “You have been brought up as one of the heathen,” said she. Then she produced a small book, and Letitia was bidden to seat herself upon a stool and learn the doctrine of predestination before breakfast. The kitchen was lighted only by one tallow candle and the firelight, for it was still far from dawn. Letitia drew her little stool close to the hearth, and bent anxiously over the fire-lit page. She committed to memory easily, and repeated the text like a frightened parrot when she was called upon. Letitia, having completed her task, was given her breakfast. It was only a portion of corn-meal porridge in a pewter plate. She had never had such a strange breakfast in her life, and she did not like corn-meal. She sat with it untasted before her. “Why don't you eat?” asked her great-great-great-grandmother severely. “I — don't — like — it,” faltered Letitia. If possible, they were all more shocked by that than they had been by her ignorance. “She doesn't like the good porridge,” the little great-great-aunts said to each other. “Eat the porridge,” commanded Captain John Hopkins sternly, when he had gotten over his surprise. Letitia ate the porridge, every grain of it. After breakfast the serious work of the day began. Letitia had never known anything like it. She felt like a baby who had just come into a new world. She was ignorant of everything that these strange relatives knew. It made no difference that she knew some things which they did not, some advanced things. She could, for instance, crochet, if she could not knit. She could repeat the multiplication-table, if she did not know the doctrine of predestination; she had also all the States of the Union by heart. But advanced knowledge is not of as much value in the past as past knowledge in the future. She could not crochet, because there was no crochet needles; there were no States of the Union; and it seemed doubtful if there was a multiplication-table, there was so little to multiply. So Letitia had set herself to acquiring the wisdom of her ancestors. She learned to card, and hetchel, and spin and weave. She learned to dye cloth, and make coarse garments, even for her great-great-great-grandfather, Captain John Hopkins. She knitted yarn stockings, she scoured brass and pewter, and, more than all, she learned the entire catechism. Letitia had never really known what work was. From long before dawn until long after dark, she toiled. She was not allowed to spend one idle moment. She had no chance to steal out and search for the little green door, even had she not been so afraid of wild beasts and Indians. She never went out of the house except on the Sabbath day. Then, in fair or foul weather, they all went to meeting, ten miles through the dense forest. Captain John Hopkins strode ahead, his gun over his shoulder. Goodwife Hopkins rode the gray horse, and the girls rode by turns, two at a time, clinging to the pillion at her back. Letitia was never allowed to wear her own pretty plain dress, with the velvet collar, even to meeting. “It would create a scandal in the sanctuary,” said Goodwife Hopkins. So Letitia went always in the queer little coarse and scanty gown, which seemed to her more like a bag than anything else; and for outside wraps she had — of all things — a homespun blanket pinned over her head. Her great-great-grandmother and her great-great-aunts were all fitted out in a similar fashion. Goodwife Hopkins, however, had a great wadded hood and a fine red cloak. There was never any fire in the meeting-house, and the services lasted all day, with a short recess at noon, during which they went into a neighboring house, sat round the fire, warmed their half frozen feet, and ate cold corn-cakes and pan-cakes for luncheon. There were no pews in the meeting-house, nothing but hard benches without backs. If Letitia fidgetted, or fell asleep, the tithing-men rapped her. Letitia would never have been allowed to stay away from meeting, had she begged to do so, but she never did. She was afraid to stay alone in the house because of Indians. Quite often there was a rumor of hostile Indians in the neighborhood, and twice there were attacks. Letitia learned to load the guns and hand the powder and bullets. She grew more and more homesick as the days went on. They were all kind to her, and she became fond of them, especially of the great-great-grandmother of her own age, and the little great-great-aunts, but they seldom had any girlish sports together. Goodwife Hopkins kept them too busily at work. Once in a while, as a special treat, they were allowed to play bean-porridge-hot for fifteen minutes. They were not allowed to talk after they went to bed, and there was little opportunity for girlish confidences. However, there came a day at last when Captain Hopkins and his wife were called away to visit a sick neighbor, some twelve miles distant, and the four girls were left in charge of the house. At seven o'clock the two younger went to bed, and Letitia and her great-great-grandmother remained up to wait for the return of their elders, as they had been instructed. Then it was that the little great-great-grandmother showed Letitia her treasures. She had only two, and was not often allowed to look at them, lest they wean her heart away from more serious things. They were kept in a secret drawer of the great chest for safety, and were nothing but a little silver snuff-box with a picture on the top, and a little flat glass bottle, about an inch and a half long. “The box belonged to my grandfather, and the bottle to his mother. I have them because I am the eldest, but I must not set my heart on them unduly,” said Letitia's great-great-grandmother. Letitia tried to count how many “greats” belonged to the ancestors who had first owned these treasures, but it made her dizzy. She had never told the story of the little green door to any of them. She had been afraid to, knowing how shocked they would be at her disobedience. Now, however, when the treasure was replaced, she was moved in confidence, and told her great-great-grandmother the story. She said the last with something of an air of superior virtue. Letitia felt terribly ashamed. “Is there any key to your little green door?” she asked meekly. For answer her great-great-grandmother opened the secret drawer of the chest again, and pulled out a key with a green ribbon in it, the very counterpart of the one in the satin-wood box. Letitia looked at it wistfully. “There may not be any Indians or catamounts there,” ventured Letitia. “There might be something a great deal worse,” returned her great-great-grandmother severely. After that there was silence between the two, and possibly also a little coldness. Letitia knitted and her great-great-grandmother knitted. Letitia also thought shrewdly. She had very little doubt that the key which she had just been shown might unlock another little green door, and admit her to her past which was her ancestors' future, but she realized that it was beyond her courage, even if she had the opportunity, to take it, and use it provided she could find the second little green door. She had been so frightfully punished for disobedience, that she dared not risk a second attempt. Then too how could she tell whether the second little green door would admit her to her grandmother's cheese-room? She felt so dizzy over what had happened, that she was not even sure that two and two made four, and b-o-y spelt boy, although she had mastered such easy facts long ago. Letitia had arrived at the point wherein she did not know what she knew, and therefore, she resolved that she would not use that other little key with the green ribbon, if she had a chance. She shivered at the possibilities which it might involve. Suppose she were to open the second little green door and be precipitated head first into a future far from the one which had merged into the past, and be more at a loss than now. She might find the conditions of life even more impossible than in her great-great-great-grandfather's log cabin with hostile Indians about. It might, as her great-great-grandmother Letitia had said, be much worse. So she knitted soberly, and the other Letitia knitted, and neither spoke, and there was not a sound except the crackling of the hearth fire and bubbling of water in a large iron pot which swung from the crane, until suddenly there was a frantic pounding at the door, and a sound as if somebody were hurled against it. Both Letitias started to their feet. Letitia turned pale, but her great-great-grandmother Letitia looked as usual. She approached the door, and spoke quite coolly. “Who may be without?” said she. She had taken a musket as she crossed the room, and stood with it levelled. Letitia also took a musket and levelled it, but it shook and it seemed as if her great-great-grandmother was in considerable danger. “Who is me?” inquired Great-great-grandmother Letitia, but she lowered her musket, and Letitia did the same, for it was quite evident that this was no Indian and no catamount. “It is Josephus Peabody,” answered the boy's voice, and Letitia gasped, for she remembered seeing that very name on the genealogical tree which hung in her great-aunt Peggy's front entry, although she could not quite remember where it came in, whether it was on a main branch or a twig. “Are the Injuns after you?” inquired Great-great-grandmother Letitia. “You rake the ashes over the fire, while I let him in,” ordered the great-great-grandmother Letitia, peremptorily, and Letitia obeyed. She raked the ashes carefully over the fire, she hung blankets over the shutters, so there might be no tell-tale gleam, and the other Letitia drew bolts and bars, then slammed the door to again, and the bolts and bars shot back into place. When Letitia turned around she saw a little boy of about her own age who looked strangely familiar to her. He was clad in homespun of a bright copperas color, and his hair was red, cut in a perfectly round rim over his forehead. He had big blue eyes, which were bulging with terror. He drew a sigh of relief as he looked at the two girls. With that the boy brandished a wicked-looking knife. “You might have done something with that,” remarked Great-great-grandmother Letitia, and her voice was somewhat scornful. Letitia was quite sure that the boy lied, but she knew that he lied to please her, and she liked him for it. “I can handle a musket as well as a man,” said Josephus Peabody with such a straightening of his small back that it seemed positively alarming, and another glance at Letitia, who returned it. She thought him a very pretty boy, and quite brave, offering to guard the path all alone, although he was so young, not much older than she was. Letitia was horribly afraid, but she had learned in the Spartan household of her ancestors, to be more afraid of fear than of anything else, so she pulled a blanket over her head and shouldered a musket, and, after the elder Letitia had unbarred and unbolted the door, they all stepped out into the night, armed and ready to guard the house. “They are Injuns,” said the boy stoutly, peering out into the gloom. They were in perfect darkness, for it was a cloudy night, and not a ray came from the house-door. “For what reason were you abroad to-night?” inquired the elder in what Letitia considered a disagreeably patronizing tone as addressed to such a pretty brave little boy. “I went to visit my rabbit traps,” replied the boy, but his voice was slightly hesitant. Letitia felt sure that the boy hung his head in the darkness. He mumbled something incoherent. With that, Great-great-grandmother Letitia, musket over shoulder, moved down the path and stood quite concealed as if by a vast cloak of night, an alert vigilant young figure with the hot blood of her time leaping in her veins, and the shrewd brain of her time alive to everything which might stir that darkness with sound or light. “Who are you?” whispered Letitia to the boy. “I am Josephus Peabody, but I was always called Joe till I came here,” the boy whispered back. “Seems to me we did,” said Letitia, and her own tone was dazed and hopeless. Letitia nodded in the dark. “That is the way here,” said she. “I didn't, honestly,” said Josephus Peabody. “Where did you come from to-night?” asked Letitia. “Why, I came from Mr. Cephas Holbrook's. It's about ten miles away on that side.” The boy pointed in the dark. “So did I,” said Letitia. “I don't know. I don't think I am,” replied Letitia miserably. “It is just the same with me,” whispered the boy. Letitia jumped. “A book!” she repeated feebly. “I remember now Aunt Peggy told Hannah about it,” whispered Letitia with sudden remembrance. “Did it have a green ribbon on it?” whispered Letitia breathlessly. Letitia sighed. “Do you like it here?” she whispered. “Has it a green ribbon on it?” whispered Letitia fearfully. “That's very funny — just like me,” said Josephus. However, the flames leaped high into the great chimney mouth, when Captain John Hopkins and his wife entered. “How pleasant it is, and how thankful we ought to be to have a good warm room to enter,” said Great-great-great-grandmother Letitia Hopkins, although she looked very grave. The sick neighbor was very sick unto death, it was feared, and she was a good woman and a good neighbor. Josephus Peabody stayed all night and slept wrapped up in a homespun blanket beside the fire, but the next morning it was hardly daylight before Goodman Cephas Holbrook came for him. Cephas Holbrook was a very stern man, and he believed in the rod. Before Josephus left he had just one chance and he improved it. It was while Mr. Holbrook was partaking of a glass of something warm and spicy which Great-great-great-grandmother Letitia Hopkins mixed for him. It was a cordial of her own compounding and a good thing for the stomach on a bitter morning, and this morning was very bitter. “You had better —” began Josephus, and he nodded meaningly. Letitia knew what he meant, but she had no chance to reply, for Mr. Holbrook had finished his cordial and had Josephus by the hand, and was jerking him rather forcibly out of the door. “A froward child, I fear,” remarked Captain John Hopkins when they had gone. “He is afraid of Injuns when there are none, too,” said Great-great-grandmother Letitia. Letitia was very sure that he would not, and she pitied poor Josephus Peabody with all her heart. She also pitied herself more than usual that day, for the cold was stinging, and she was put to hard tasks, and she felt forlorn at the thought that her little brother in the hardships of the Past might that very night strive to make his escape. Gradually her own resolve grew. She was horribly afraid, but she was also horribly homesick, and homesickness will urge to desperate deeds. That night, also, Captain John Hopkins and his wife went to visit the sick neighbor, and, after the younger sisters were in bed, Letitia was left alone with her great-great-grandmother, who was sleepy. Letitia did not talk; she knitted, with a shrewd eye upon the elder Letitia, who presently fell fast asleep. Then Letitia rose softly, and laid down her knitting work. It might be her chance for nobody knew how long, and Josephus might even now be entering his book. She pulled off her shoes, tiptoed in her thick yarn stockings up to the loft, got her own clothes out of the chest, and put them on. The little great-great-aunts did not stir. Letitia blew a kiss to them. Then she tiptoed down, got the key out of the secret drawer, blew another farewell kiss to her sleeping great-great-grandmother and was out of the house. It was broad moonlight outside. She ran around to the north side of the house, and there was the little green door hidden under the low branches of the spruce tree. Letitia gave a sob of fear and thankfulness. She fitted the key in the lock, turned it, opened the door, and there she was back in her great-aunt's cheese-room. She shut the door hard, locked it, and carried the key back to its place in the satin-wood box. Then she looked out of the window, and there was her great-aunt Peggy, and the old maid-servant just coming home from meeting. Letitia confessed what she had done, and her aunt listened gravely. Letitia did not say anything about Josephus Peabody. She was not sure that he had made his escape, and if he had his grandmother might punish him, and she considered that he had probably suffered enough at the hands of Goodman Cephas Holbrook. “Well, it was a hard lesson to learn, and I hoped to spare you from it, but perhaps it was for the best,” said her great-aunt Peggy. “It doesn't take as long to visit the past as it did to live in it,” replied her aunt. Then she sent Letitia to her room for the satin-wood box, and, when she had brought it, took out of it a little parcel, neatly folded in white paper, tied with a green ribbon. “Open it,” said she. Letitia untied the green ribbon and unfolded the paper, and there was the little silver snuff-box which had been the treasure of the great-great-grandmother, Letitia Hopkins. She raised the lid, and there was also the little glass bottle. Then Aunt Peggy hurried out to tell Hannah, the maid servant, to have some tea, and hot biscuits, and quince preserves, and pound cakes served before the guests left, and Hannah with a shawl over her head, went out and backed the old lady's horse into the barn, and Mrs. Joe Peabody and her grandson entered. “Yes'm,” said Letitia. She and Joe glanced at each other, and their eyes were very big, and their cheeks very red. Later on when the tea and biscuits and preserves and pound cake were served, Joe and Letitia got a chance for a word. “You got back alright through the little green door,” whispered Joe. “Oh,” gasped Letitia fervently, and she took a bite of pound cake. “This would have been corn meal mush there,” said she. “And I should have got another whipping after I got out of the book like the one I had before I got in,” said Joe.